After a lovely day at Calgary Bay, the weather turned a little gloomy again, but when we had last seen the forecast it was just the one day of glooms we planned the following day to climb Ben More, something on our wish list while we were in Mull. We used the dreary morning to make our way around the narrow coast road, heading south from Calgary. 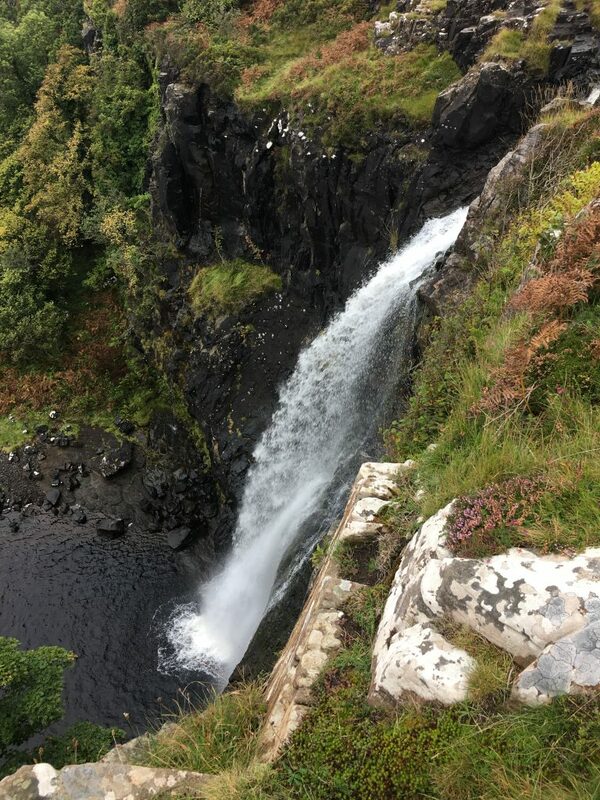 On the way we stopped at the Eas Fors waterfalls where we made a fried breakfast to cheer us up. The falls were pretty but lots of people don’t realise that it’s the waterfall down to the beach that is the most spectacular. You can walk to the bottom to view it from the beach, but it was too damp to tempt us so we just viewed it from the top of the cliff. Apart from Eas Fors there weren’t many parking spots along this road, something that I’ve noticed in general in Mull; long stretches of scenic coast with nary a parking spot to appreciate it. After the falls the one parking space we saw had a height barrier – how rude! It made me quite grumpy, it’s no wonder that people stop in passing places. We finally reached the stretch of road where we wanted to park up. 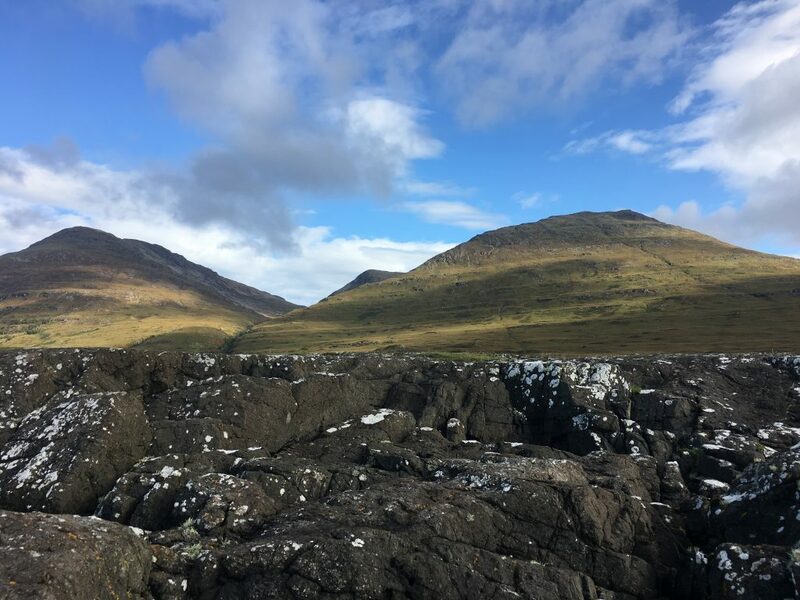 We had a short pause to let a herd of cattle past us before we got to our first choice of spot – the main parking area for people climbing Ben More – but it looked too boggy and we retraced our steps back to the firmer parking at Rubha na Moine. We were sitting comfortably alone in this parking spot looking out to sea when Paul spotted an otter on the rocks rolling around in the seaweed looking like it was having a whale of a time. Another campervan drove up after fifteen minutes of this and the otter scarpered only to be replaced a few minutes later by a sea eagle swooping down on a couple of small seabirds that were bobbing on the water (it missed). Suddenly the day seemed a lot more exciting. 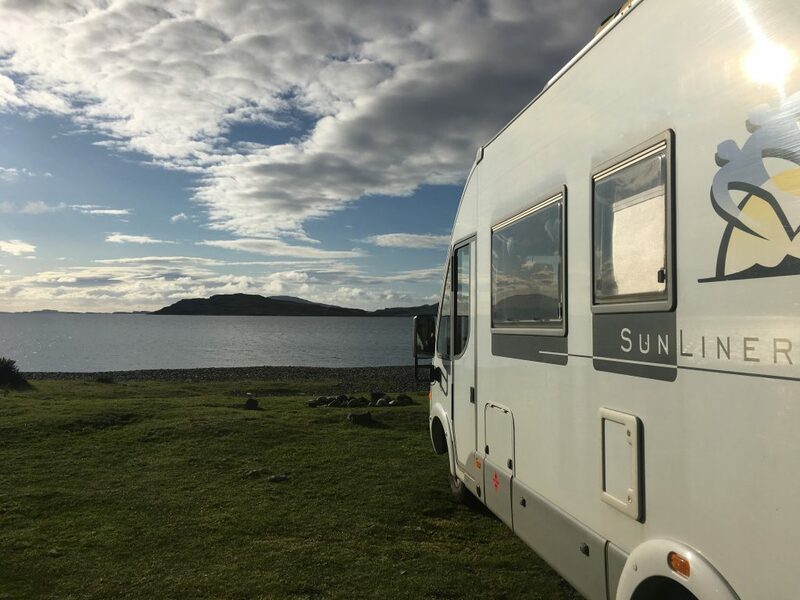 When we popped out for a chat with the people in the campervan it transpired that they didn’t see the otter because they were busy watching two sea eagles ‘talon grabbing’ above Bertie – something we’d been completely unaware of. The evening did literally get brighter. Ben More had been mist bound when we arrived but by sundown only the summit had a cap of cloud. We could clearly see our route up the mountain. 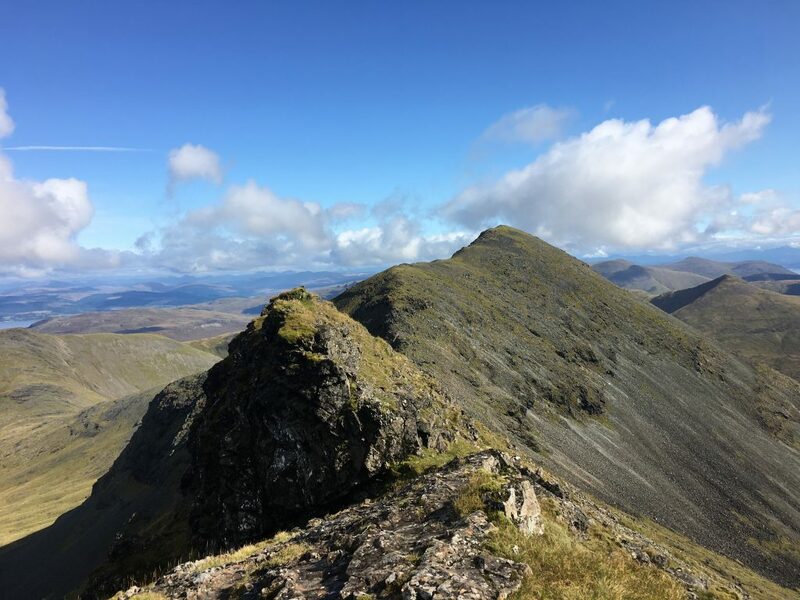 Firstly up the slopes of Beinn Fadha and then along the ridge of A’ Chioch before continuing onto the ridge of Ben More, then a leisurely descent via the usual route up Ben More. The following morning we were up and out by 8:30. We wanted to make it to the summit before any cloud came in. The first 500 meters of ascent were admittedly a bit tiresome, with boggy stretches and no clear path, plus I hadn’t realised that the sun would rise in the gap between the hills and shine directly into our faces on the way up – and I had left my sunhat behind. When we hit the upper slopes of Beinn Fhada things started to pick up, and the ridge ahead of us was looking both inviting and challenging. We kept to the ridge line as much as possible, but it was obviously not a well trodden route and the rocks were slippery with moss and the morning dew that hadn’t yet evaporated. When we reached the most difficult section of the ridge – a small rock tower with a north facing scramble to it’s top – I chickened out. I couldn’t get purchase on the rocks and it was pretty exposed so I took the path round the base of the tower and climbed up a drier set of rocks on the south side of the ridge a few yards later. 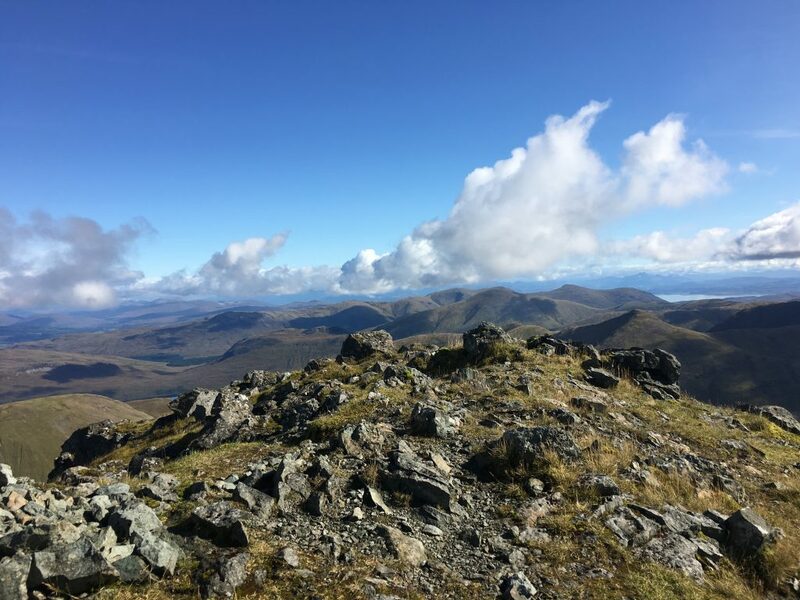 We had been completely alone on this walk so far, only the crampon scratches on the rocks indicating that people had been there before us, so when we finally emerged at the summit of Ben More it was a shock to see half a dozen other people who had walked up the other route. As we started to make our way down from the summit we felt relieved we hadn’t come up this way, there was a very dull initial section of zig zags through scree before it dropped low enough that the path was on rock and grass. It was at this point that I realised I had lost something – we hadn’t had any internet for three days and so we had taken our mifi device to the top of the mountain so that we could get the weather forecast and drop friends and family a message. We stopped for a bite to eat on the way down and I thought I would check whether we still had any signal…no mifi device…my heart dropped. I left Paul with the rucksacks as I made my way back uphill expecting to have to go two miles to the summit. On the way back up I thought I would ask the other people on the decsent whether they had found it and luck would have it that the first couple I asked – who we’d overtaken some time before – had found it. The relief fuelled the remainder of the walk and not even Paul’s jibes could upset me. The carpark at the bottom of Ben More was really busy when we got down – that’s what happens on a rare sunny Sunday. Even our parking spot was getting full with another motorhome and campervan and a couple of cars. 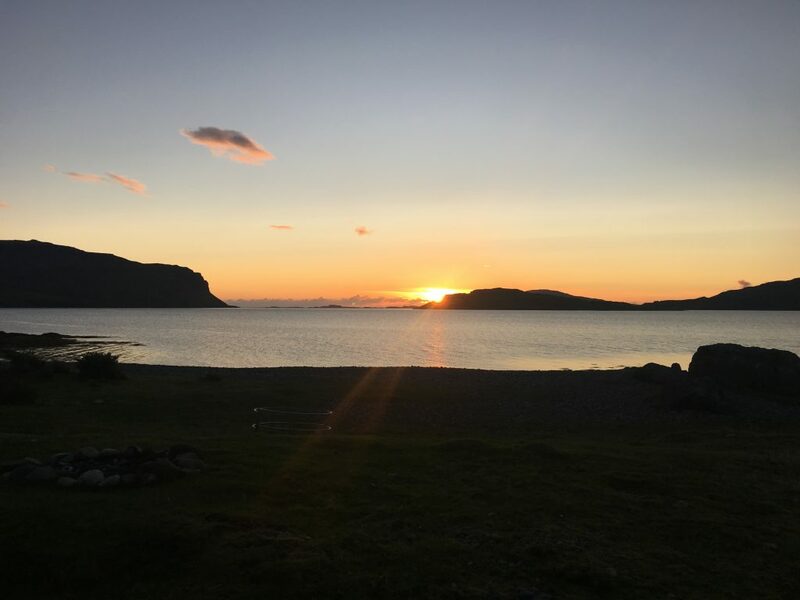 It was so beautiful we decided to stay for another night and spent the evening chilling out and watching an otter swimming around.